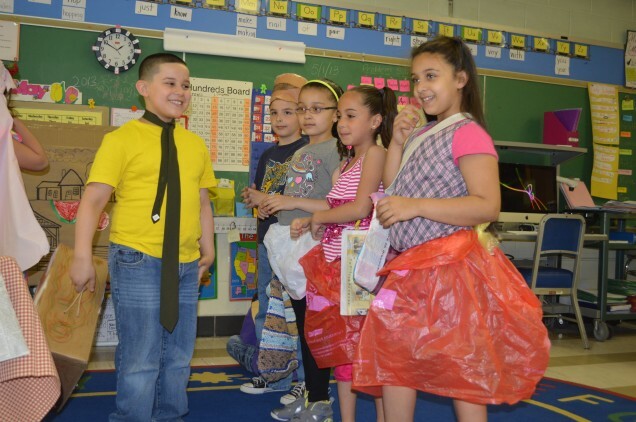 From Page to Stage is an arts-integrated approach to English Language Arts that is engaging, inclusive, and supports meaningful learning. Working in collaboration with classroom teachers, ECT teaching artists select a piece of literature to explore and adapt into a play. The From Page to Stage format enhances literacy and reading comprehension, content mastery, and communication skills. During the course of the workshop, teachers are taught how to work with students to explore character, setting and plot through theater and movement. We work on emodying vocabulary, and discovering text-to-self connections. The goal is to help students become immersed in the world of the chosen book and understand the story and its concepts on a deep and personal level. Simultaneously, we focus on the development of social/emotional skills through the arts (collaboration, listening, and self-awareness), creativity (imagination, problem solving, and generating ideas), and self-presentation (verbal and non-verbal communication skills). This approach is particularly effective for second language learners. PreK-Grade 2: Tough Boris, by Mem Fox, The Very Hungry Caterpillar, by Eric Carle, The Lorax, by Dr. Seuss, From the Bellybutton of the Moon, bilingual poetry by Francisco X. Alarcon. Grades 3-5: Lyddie by Katherine Patterson, The War with Grandpa, by Robert Kimmel Smith, and folktales from around the world. For information on how to bring From Page to Stage or any ECT Professional Development workshop to your school, email celine@enchantedcircletheater.com or call (413) 534-3789.